Walk around any gym in the world, and you’ll likely see some pretty silly events going down. Sometimes it will be a weak looking person attempting to bench press about 100 pounds more than he should be, with an equally scrawny training partner above him rowing the weight above him loudly. Often, we’ll see men brave enough to enter the squat rack, but lacking the courage to complete repetitions more than one-eighth of the way down. And there’s always the young man training biceps without training them at all. You know the type. He’ll curl the dumbbells so violently that his back will get the workout his biceps should be enjoying. Such training practices are dangerous, a waste of time, and really take away emphasis from some really good failure and buddy training techniques which can make a huge difference in the gym. Let’s examine a few “brothers-in-arms” exercises and see how they can help lead to muscle gain, when used correctly. “Brothers-in-Arms” training is very simple. You and a partner (or two) will train together using the same weight for an isolation movement using a barbell which can be handed back and forth very quickly. You will stand there and complete your standard 8 to 12 repetitions, then hand it to your training partner. Just like you, he will complete his standard amount of repetitions. This is normally the point where you would both take a break. But not today! Instead, he will hand the bar back to you. You will then, after only enjoying 30 to 40 seconds of rest, will be required to shoot for your same 8 painful repetitions. When you complete them, pass the bar back to your friend, where he will have to complete 8 reps. He’ll hand it back to you, where you might eke out 4 to 5 reps. You will then continue going back and forth until neither of you can complete a single rep. The last man to curl – wins! This exercise technique works wonderfully for many movements. 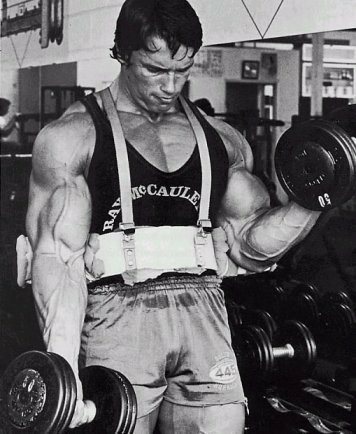 Barbell curls, EZ-bar curls, skull rushers, EZ bar triceps presses, reverse-grip biceps curls, and forearm wrist curls from both angles are all useful movements. Always wear gloves when training in this manner. Aside from the fact you wouldn’t want to swap body fluids with anyone else in the gym, the barbell can become very slippery when you’re training in this manner, which can lead to slippage and possible injury. Gloves make that hand-off transition smoother as well, and less awkward should you end up touching one another’s’ hand. If you are used to using an mp3 player, you may want to turn it off for this movement. Find a training partner who is similar in size and strength to you. It wouldn’t make much sense for a 120-pound beginner to train “Brothers-in-Arms” style with Ronnie Coleman, now would it? The weight selected should be equally beneficial to both lifters. If one man can complete 8 reps and the other man only completes two, then one of them is wasting his time!